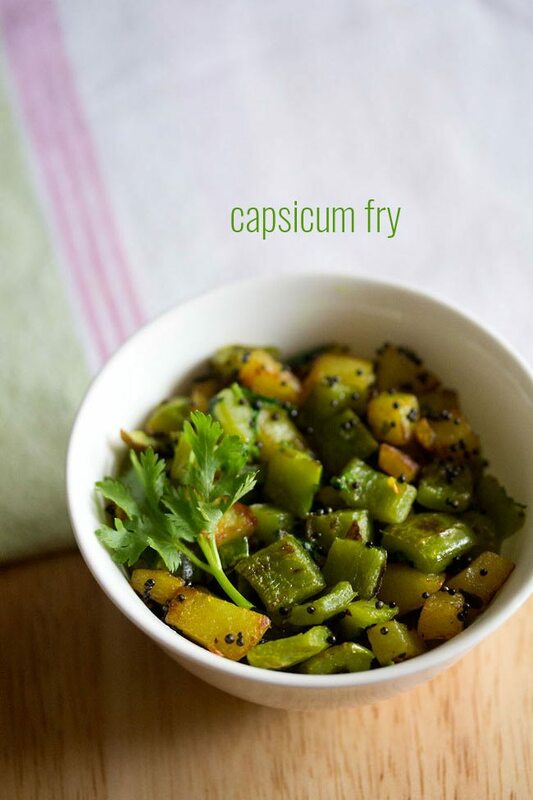 a simple yet delicious baby corn pepper fry. 5 ingredient recipe. 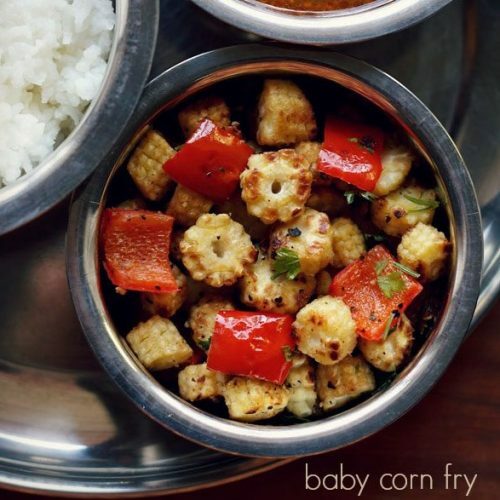 baby corn fry recipe with step by step photos – simple, easy and quick baby corn fry recipe made with 5 ingredients. 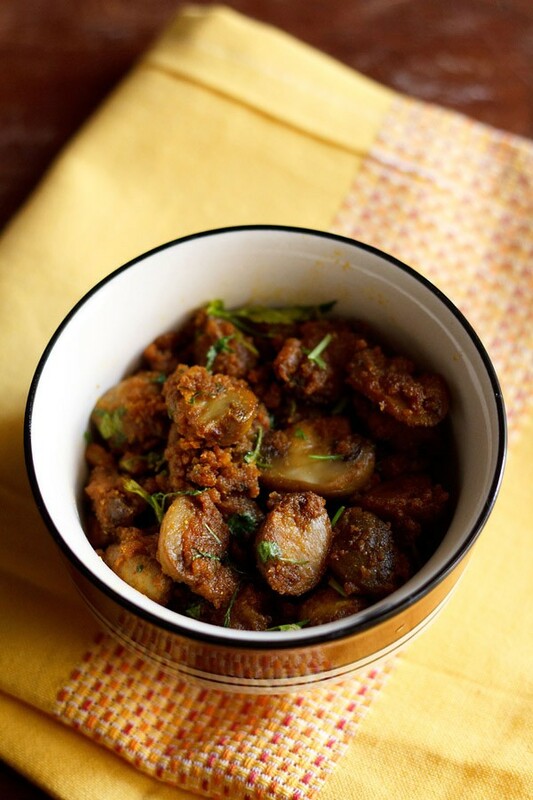 baby corn fry is one of those recipes i make as a side dish to go along with main course like khichdi, dal-rice or sambar-rice. 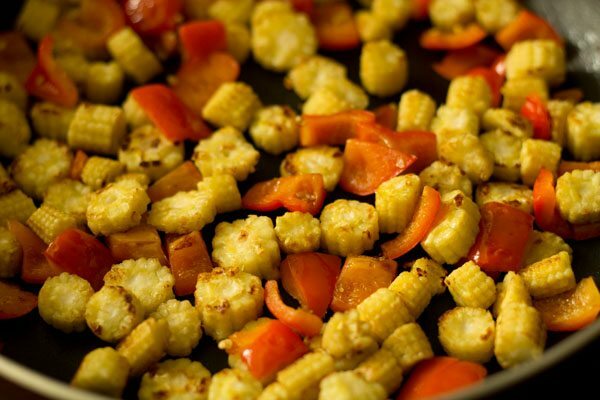 i usually keep the spicing minimal in this recipe to let the flavors of baby corn come through. at times i also add bell peppers. in the recipe posted here, i have used red bell pepper. you can even add yellow or green bell pepper. addition of bell pepper is optional. however i would suggest to add bell pepper as it goes very well in this recipe. this is also a no onion no garlic recipe. 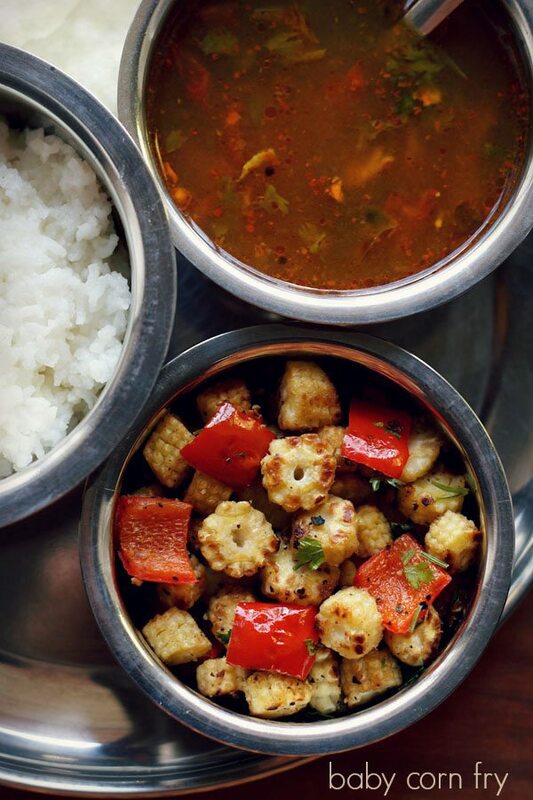 chilli baby corn recipe (spicy indo chinese). 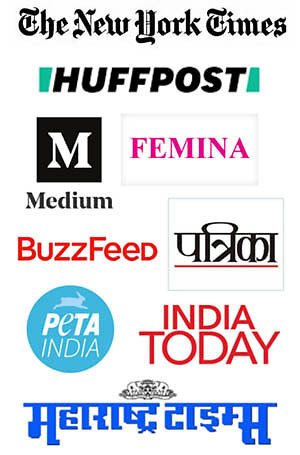 if you are looking for more baby corn recipes then do check baby corn manchurian, baby corn rice, baby corn masala, baby corn jalfrezi and chilli baby corn gravy. rinse 200 grams baby corn and 1 medium bell pepper (capsicum or shimla mirch). slice the baby corn in rounds and chop the bell pepper. heat 1 tablespoon olive oil in a pan. you can also use sunflower oil, if you do not have olive oil. add the sliced baby corn. stir well. saute the baby corn on a low to medium flame till the edges become a light golden. then add the chopped red bell pepper. stir and saute till the capsicum is half cooked. by this time the baby corn will also get browned from the edges and become crisp. the bell pepper or capsicum will have crunch and will be half cooked. 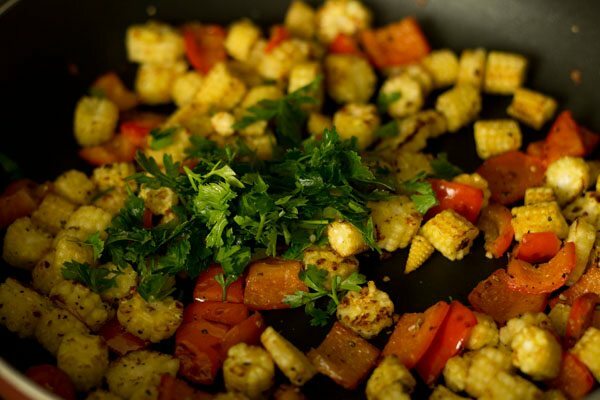 you do have to stir at intervals while making this baby corn fry recipe for even cooking. cooking the baby corn takes about 6 to 7 minutes. if you slice the baby corn more thinly, the more faster they will cook. add 1/2 teaspoon crushed black pepper and salt as per taste. 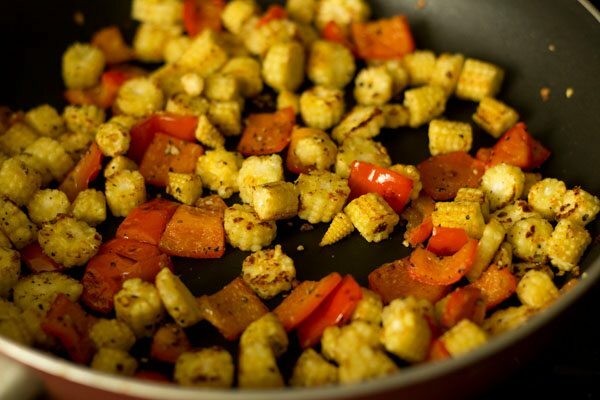 mix the salt and pepper with the sauteed baby corn and bell pepper. switch off the flame. now add 1 tablespoon chopped parsley leaves. 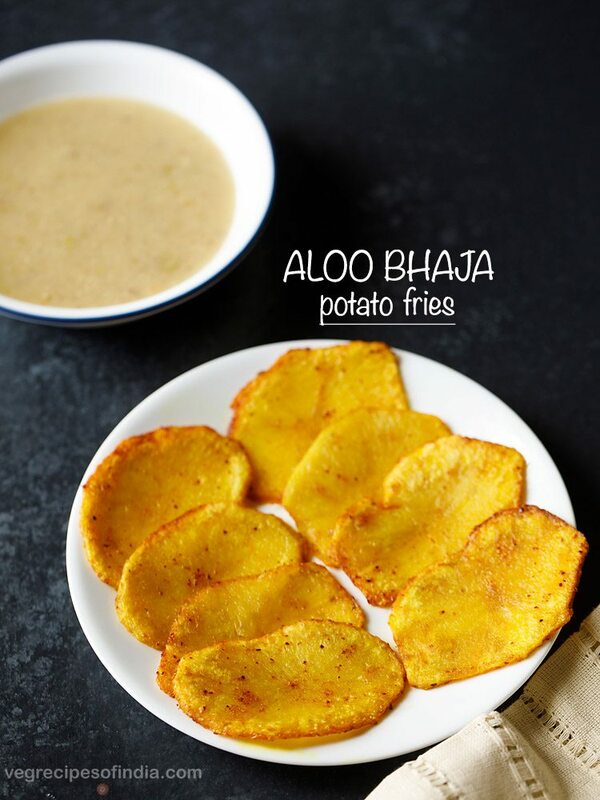 you can also add coriander leaves instead of parsley leaves. mix the parsley leaves very well. 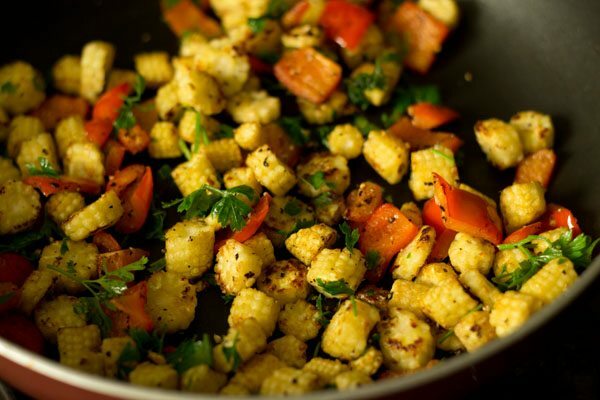 serve baby corn fry as a side dish with a main course meal. 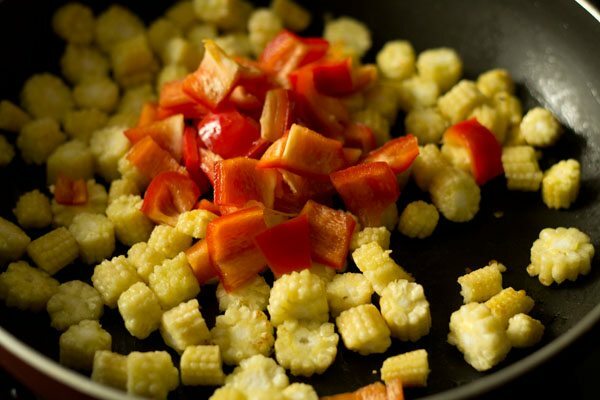 1. rinse 200 grams baby corn and 1 medium sized bell pepper. 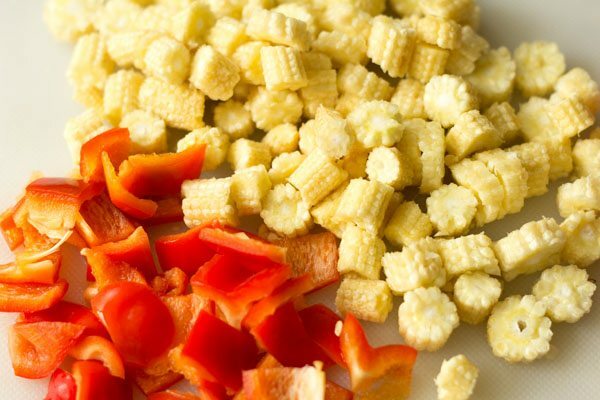 slice the baby corn in rounds and chop the bell pepper. 2. heat 1 tablespoon olive oil in a pan. 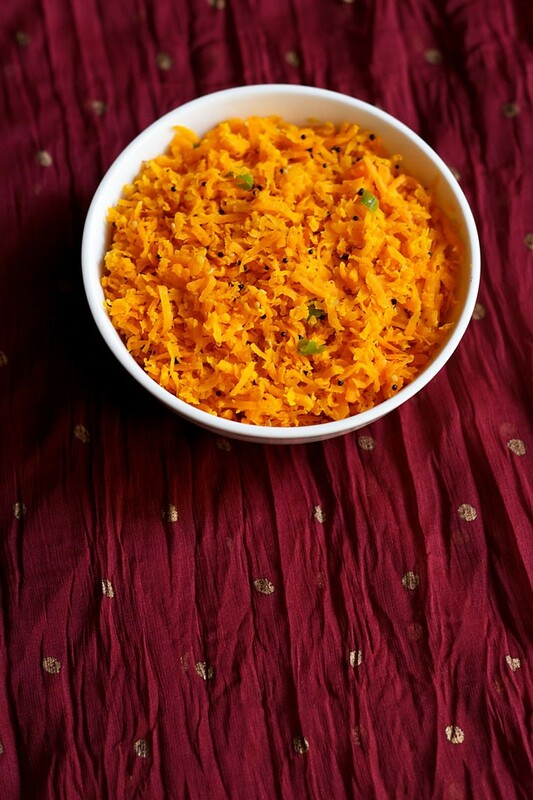 you can also use sunflower oil, if you do not have olive oil. add the sliced baby corn. stir well. 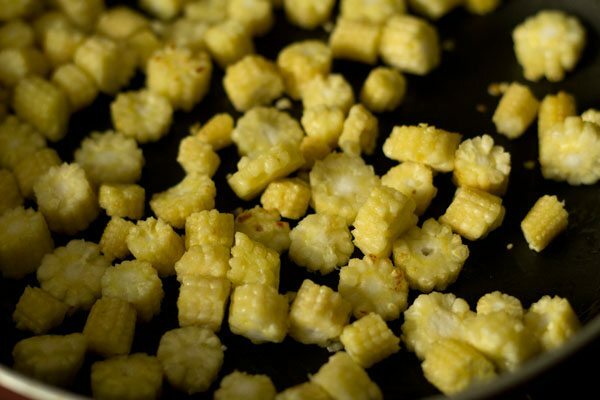 3. saute the baby corn on a low to medium flame for 1 to 2 minutes. 4. then add the chopped red bell pepper. 5. stir and saute till the capsicum is half cooked. by this time the baby corn will also get browned from the edges and become crisp. the bell pepper or capsicum will have crunch and will be half cooked. 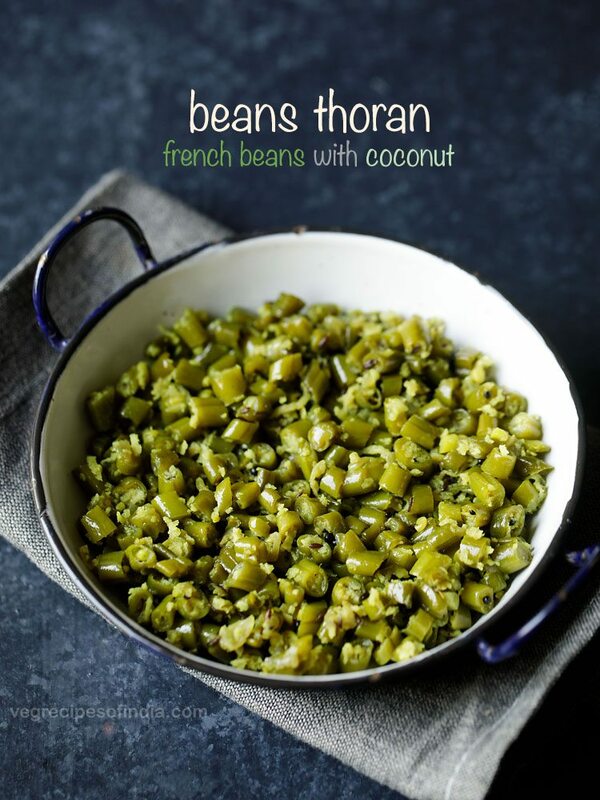 you do have to stir at intervals while making this recipe for even cooking. cooking the baby corn takes about 6 to 7 minutes. 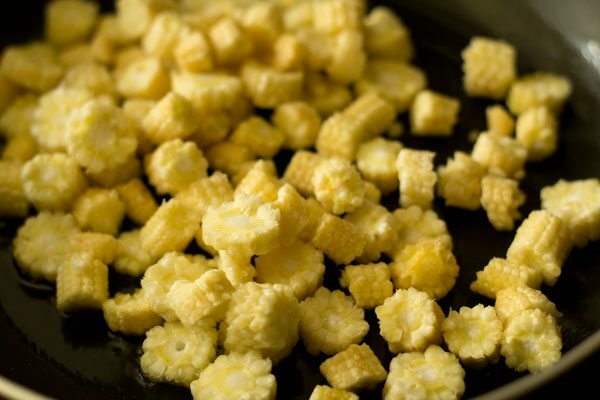 if you slice the baby corn more thinly, the more faster they will cook. 6. add ½ teaspoon crushed black pepper and salt as per taste. 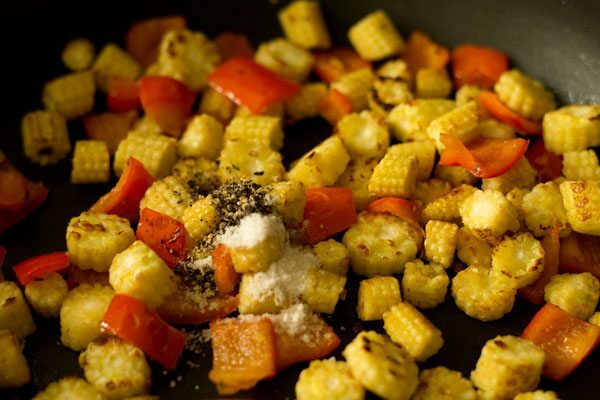 7. mix the salt and pepper with the sauteed baby corn and bell pepper. 8. switch off the flame and now add 1 tablespoon chopped parsley leaves. 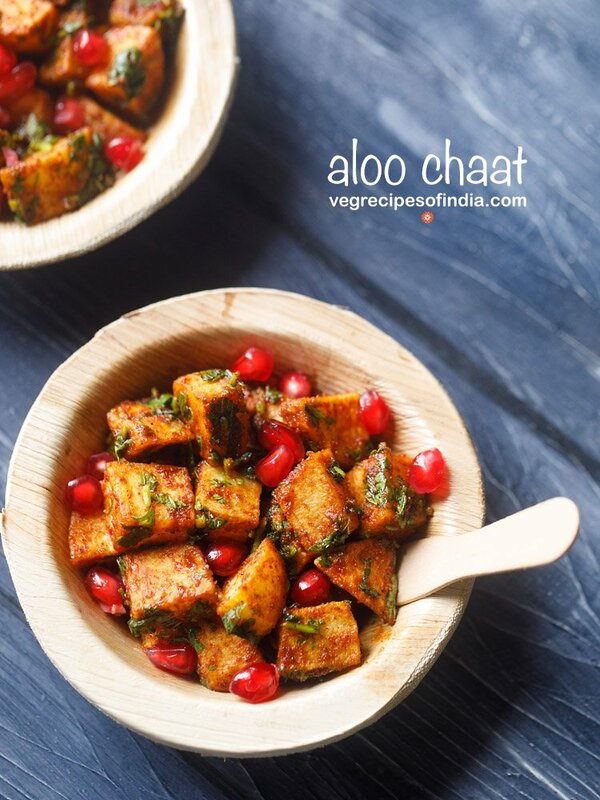 you can also add coriander leaves instead of parsley leaves. 9. mix the parsley leaves very well. 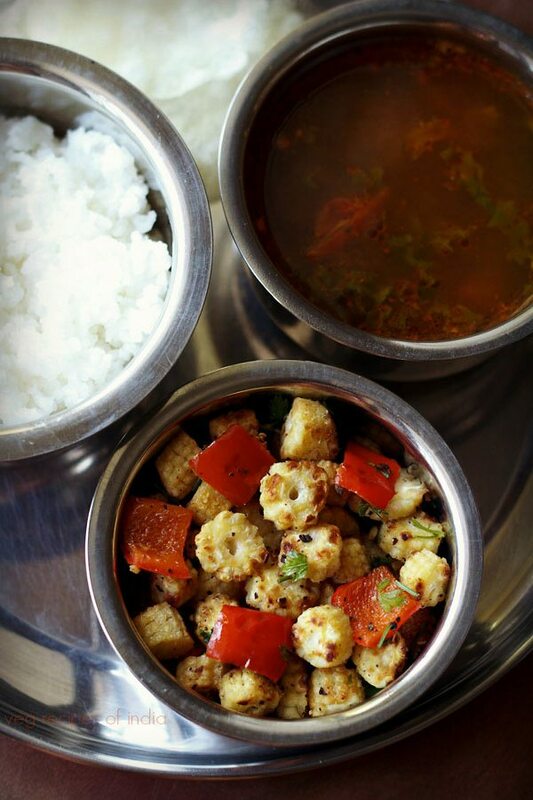 10. serve baby corn pepper fry as a side dish with a main course meal like dal-rice or sambar-rice or rasam-rice.